The notion of ‘the beautiful south’ is such a cliché that a band whose output was built on the sardonic named itself that. Of course, not all of the South is beautiful and not all of the North isn’t. It’s no longer ‘grim up north’ – to coin another cliché – now that the industry that besmirched towns and acid-etched the landscape, but paid for the houses and fed the people, has all but gone. And if London and the South East seem to be the destination for most of the country’s investment, that doesn’t mean that many other parts of the South are not straining against the odds. This is from a recent trip to the Isle of Wight. It was a fabled, idealised place when I was kid. Now, it contains some visibly hard-up areas. Getting people and things across what might seem a fairly meagre stretch of water between Southampton and Cowes costs money, and when many places are struggling, that extra bit of cost and inconvenience is a disadvantage the place could do without. 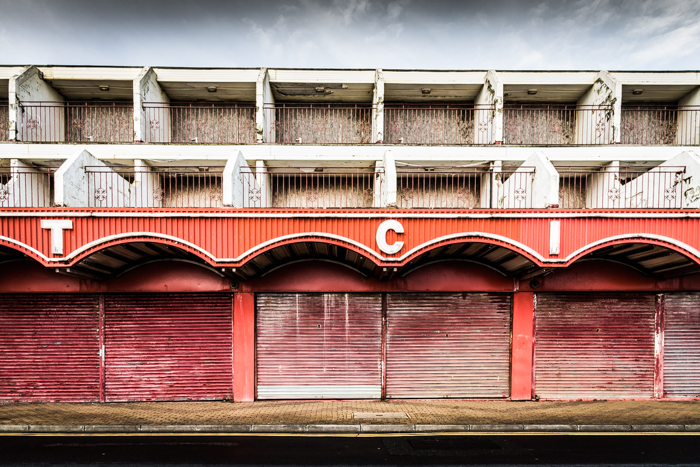 This image is of a building in Sandown; evidently shops on the ground floor and holiday lets above. Clearly, it is a photograph the island’s tourist board would hardly thank me for, but I like it. I enjoy the aesthetics both of beautiful, pristine buildings and those that wear their history as an honest indication of their status, and the status of this is clearly past-its-best, redundant and ready for either a makeover or replacement with something else. But whether there is economic sense in any of that is another matter, even though this place commands what ought to be an enviable position, on the sea front. Stephen Riley: Architectural Photography, Somerset, Dorset and Wiltshire.